At Smart Mobility World 2015, our Italian representative, Andrea Marella, was interviewed by IOT Expo. We did not manage to get rights for modification of the video, so we bring it here in the original Italian without subtitles and add an English transcript below. (The auto-transcript and auto-translate feature from Youtube is not really worth trying out in this case). Journalist Andrea Marella, from DataFromSky. I would like like to better understand in which field do work and who you are. Andrea Marella Thanks for the question. My job has been dealing with traffic and transport ambit for some years now. I discovered around one and a half year ago this service, that we are currently able to provide to our customers also here in Italy. Practically, we can record aerial videos, using drones or similar technologies, and by means of that we can analyze the video using our processing software. This allows us to extract much more information than we usually have, and not simply the static ones, but also dynamic data. So for example considering a given vehicle that has been recorded in the video, it is possible to tag it and see its movement, as well as know, for each video frame, the speed, acceleration, deceleration, time to enter, time to exit,… All these data are something that we, as traffic engineers, didn’t have until short time ago, but they’re available. Who could be interested in those data? Public administrations, traffic research centers, motorway companies, but also shopping malls. For example, we recently conducted some surveys around the Zara-Expo area in Milan, outside the Expo exhibition, where we had to evaluate and analyze the long-term flows. In conclusion, it allows collection of a large amount of data. Journalist So what you are talking about is an applicable solution, that has to do with the drone sector, and that could be very useful to compute data analysis. About the application sectors, are they related only to traffic analysis, or may they be different? Andrea Marella We developed this algorithm that allow to capture the information on a generic moving object. In this case we apply it on vehicles driving along a road, but it could be applied also, for example, to vehicles being parked, knowing the standing time of each vehicle, the enter and exit time, other different important vehicle parameters. As I told before, focusing on shopping centers, we also could estimate the queue, study possible gridlock conditions, the waiting exit time… And last but not least, the road safety, where many applications may use the data that we offer – because what in fact we do is provide information and elaborate them for the customer. This may be, as I said before, public administration, as well as an individual user. Journalist About the drone sector: It’s a field that is currently fast expanding, but at the same time faces lots of complication to freely grow, because of the problem related to the ENAC regulations, the need for license, authorization, restrictions,… At the moment work is a bit complicated. What do you think about it as an ‘inside worker’? Andrea Marella Let me start by saying that we actually provide the analysis service, and the survey phase is generally conducted by our partner companies, they have everything needed to legally and safely carry out work. What I can personally say, is that within the last 18 months we had two revisions of the regulations about flying objects; every time that I meet experts or other workers who have something to do with it, we tell each other: ”Next time will be the right one for changes!” I hope in the next time! Journalist I know. But is there a place in the world where it would be easier to start developing and launching on the market, US for example, thanks to the advantageous circumstances? In other words, is that a problem of rules, or related to how the regulations are applied in a given place? Andrea Marella I think that the regulation imposed by ENAC, that is one of the first ones adopted in Europe, still have space to correct and improve. Anyway they’re becoming aware of the problem, giving openness. For example the opportunity to fly with UAV less than 300g at 100m height on urban areas is a great possibility. On the other hand, we have UAV producers and workers, who have already invested resources and sums of money, and they’re ready to enter the market. There’s still lack of something due to, well you know in Italy, bureaucracy. For example, the need to send declaration to ENAC, ask authorizations… All these require time, days or months… more likely months! Next January probably a new application on the ENAC website will be born, that will be very helpful to simplify the procedures. I trust in this opportunity! Journalist From your point of view, what you see in the next two years? Because, as you know, the UAV sector has lots of practical uses… I’d like to know your thoughts – which applications are going to have an immediate development? And what is going to happen within the next two years? Andrea Marella Generally speaking about drones, I think that monitoring applications related to agriculture will be the biggest, and the first to grow, due to ease of work in open spaces, without constraints, safely. Next, there are research centers dealing with the general environment monitoring; I mean infrastructure monitoring, land monitoring, or related to wind farms, or, as we do, in the field of traffic monitoring. Andrea Marella No, I wouldn’t say so. We’re optimistic, we don’t want to be negative. We believe that 2016 will be a crucial year for the real growth, and that we are going to see the number of flying drones increasing. Once we are able to fly them easily, we’ll have to decide how to optimize for usefulness: then we will be ready to take advantage of it! The famous Italian exhibition Smart Mobility World also this year allowed to exhibit some of the best innovations within the traffic and mobility field. Every year more and more smart and technological, and we were there! Therefore we would like to thank to all our visitors for their interest in the exposition and our video analysis service which helped them to get a deeper understanding, for visiting our conferences (Smart Mobility World 2015 presentation), bilateral meeting, or simply for standing by and giving us some kind words. Thanks to Smart Mobility 2015 we had the opportunity to hear people’s opinions and see their interest in a project we’ve been developing for two years, with commitment and dedication, in order to provide a service that is currently one of a kind. The important results we’re getting, that can be seen on our videos and confirmed by our partners, are something we’re very proud of. We would also like to thank to la Repubblica magazine for mentioning us in their article “Smart mobility world, il futuro è prossimo nelle città italiane“. Smart Mobility World 2015 is coming soon and we will be there. 28 – 30 October 2015 in Monza (Italy) we will participate at the exhibition together with TAU company specialized in traffic engineering. We would also like to invite you to our presentation at Smart Mobility Forum in UAV & Traffic session. 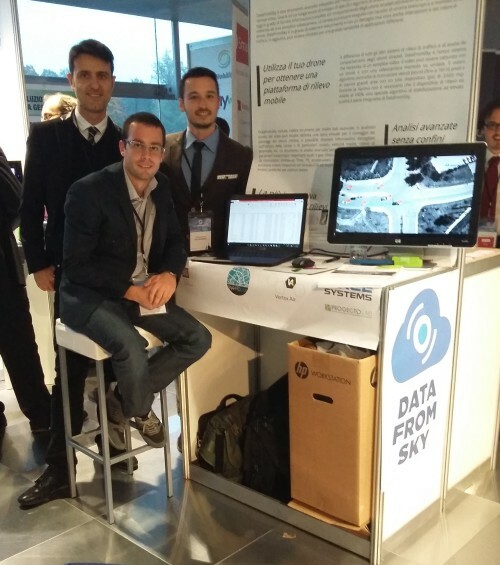 You can look forward to hearing about Solutions and Applications in Smart Mobility World by Andrea Marella representing DataFromSky. For more information about Smart Mobility World click here. DronEzine, an Italian electronic drone magazine, published an article dedicated to Smart Mobility World 2015. This year, a section will be dedicated to drone use in the field of traffic, intelligent transport systems and mobility. The article mentioned DataFromSky: “All over the world, the businesses that use UAV for this kind of mission have proliferated, such as DataFromSky, to mention just one name“. We are happy to be mentioned, since we are planning to participate again this year, after our participation last year in Turin. The 2015 edition will start on 28th October at the Italian F1 circuit in Monza, conveniently located in time and space near the end of Expo 2015. Don’t hesitate and come! Read the whole article in Italian (or the vaguely useful Google translation). Dear partners, we would like to invite you to visit as at Smart Mobility World, which take place at Lingotto Congress Centerl in Turin, on 12. 11.2014. We are looking forward to meet you!